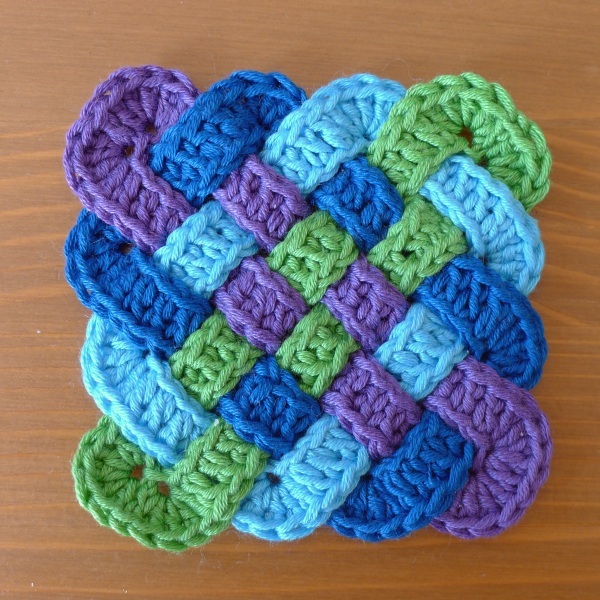 These coasters are made by interleaving four rectangular crochet strips. You only need a small amount of of yarn. Ideally made with four or at least two colours as you will see from the photographs. They should come out about 4 inches / 10cm square. Although this is a very straighforward pattern I do not consider it to be suitable for beginners. You may remember my “I have a new obsession” post. Well since then I have been working on more celtic designs, in particular I have continued thinking about how to make a coaster. 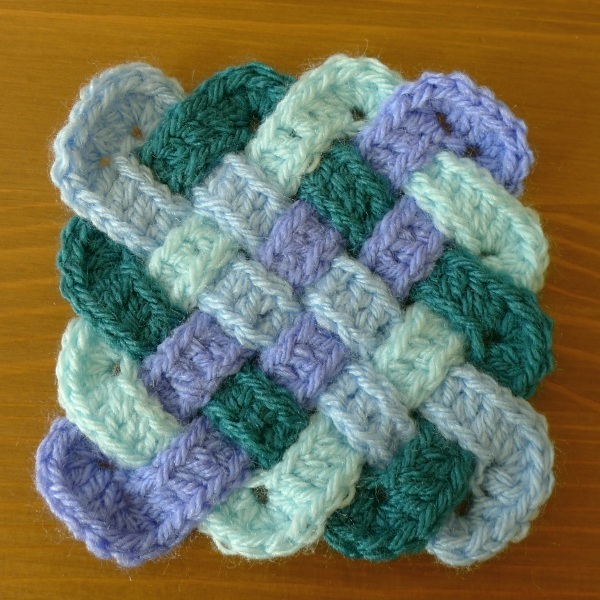 I had given up the crochet cotton coaster because my hands were hurting but it occured to me that it might be possible to make one in DK weight yarn if I gave up the idea of combining five pieces, so I tried with three and my standard method of working out how many chains were needed. I realised that although this worked well for my celtic bookmark that the gaps in the resulting coaster would be better eliminated, so I reduced the number of trebles (US-dcs) for a crossing point from four to three and tried again. I had realised that using less trebles per crossing, I could increase the number of pieces from three to four. So this is what I did and here is the result. I then got out the oddments of my Rico essentials cotton yarn and made another one. I thought it worked it even better in cotton. Now, I had shown you how I messed around with a drawing program to see how different colours could be used. I had a play and chose to make a couple more coasters like this from my regular stash. and I then thought it might be fun to use just two colours arranged so as to get a chequer pattern in the centre. I would love to make some more but my coffee table is getting a bit crowded. wow, your latest design is absolutely stunning. Hey, easy peasy … get a bigger room lol. Thank you – these are exactly what I’ve been looking for to explain how I can solve a problem on a project I’m designing. You are a gem! They are beautiful. Joanne De Rousse of Mo. The fitting the bits together is the hardest bit. The crochet should be really easy!! These are really beautiful. 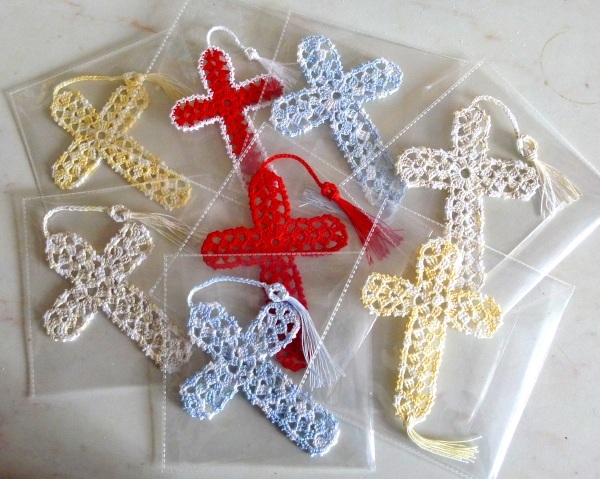 I can’t crochet, wish I could I would make these.Can you make it big enough to make a bag or a scarf. I a silky yarn a scarf would be beautiful. It would in theory be possible to make a long version like my Celtic bookmark or a square with more ribbons interweaving as it is not so hard to work up a pattern for any size but I am not sure if it would work as a scarf. It’s a useful size coffee table and it does have lots of drawers and shelves which I wanted. Glad you liked the coasters. Brilliant! The colour combos are great especially in the cotton. 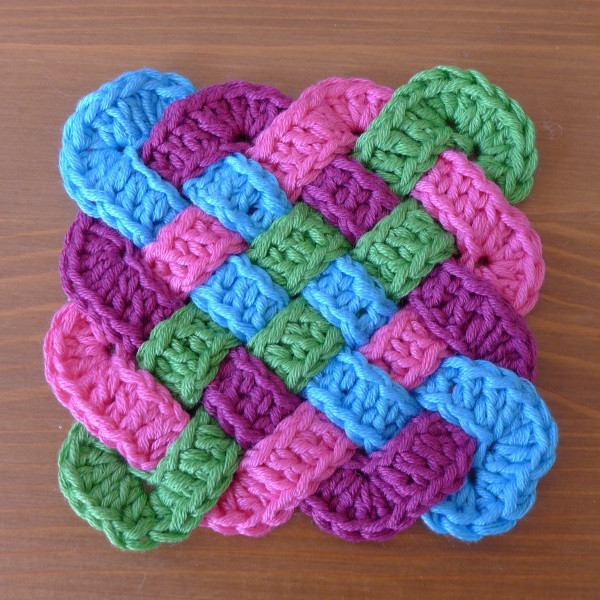 Thanks so much for putting the pattern together and sharing – it takes a lot of time to do that! I love your colour choices! Thanks for the detailed pattern and diagrams. Glad you like my sharing the patterns; they don’t take too long to make. Great pattern. These look perfect to use up some of the bits of cotton yarn that always seem to gather. I don’t know how much each piece took but they were quite small balls where I used oddments of yarn. Maybe I’m having a particularly difficult day, or maybe it’s just me. Getting these woven together seems a mystery to me. Do you start each piece, weave as you go and then complete the ‘strips’ after they are woven? I love these! They are beautiful and look useful. 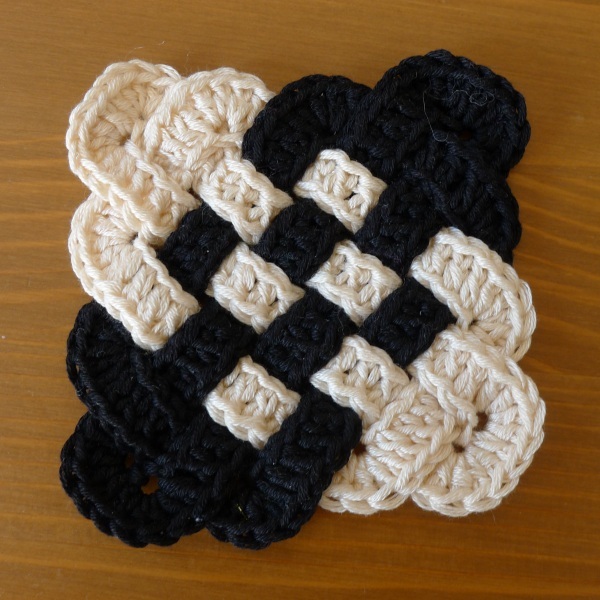 In a strong cotton, they would make lovely trivets for hot plates. Thank you for sharing…you have so many very interesting and lovely patterns. And your sharing so many is wonderful. I found your tutorial on working into chains very interesting….and yes, I’ve also found that working into the back loop also gives you a neater, more finished edge. It took quite a while to put the pattern together for the blog and it would take a lot longer to do more of a tutorial. As the pattern says: you make the four pieces first. There is a drawing that shows how to interleave the two long pieces and the colours match the sample coaster shown. The photograph shows where the other pieces go over and under the first two. I could maybe do an interim picture showing the third piece in place but I have just come back from being away and I have a lot to catch up on so I can’t do it straight away. Glad you find some of my posts helpful. Could you do a tutorial on here!!! Please!!!!!!!! 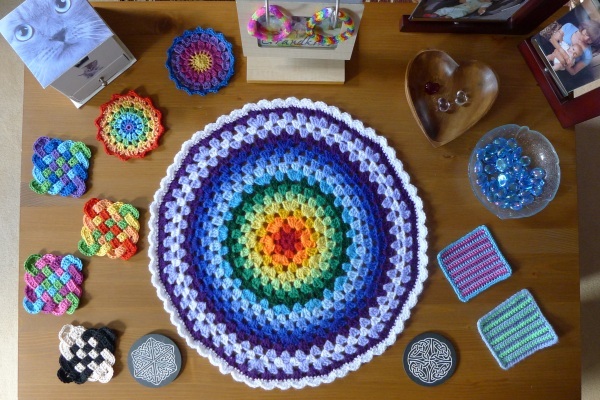 There are photographs in the link showing which part of the chain to crochet into and diagrams of how to fit the pieces together. Other than that it is just making ordinary trebles (US – dcs). I don’t think a tutorial would add anything to this. In fact photographs of me fitting the pieces together would be less useful than the diagrams. Amazing. Simply amazing. This is creative and looks great. I can’t wait to give it a try! Glad you liked them. Would love to know how you get on if you make one. Amazing, just love them! Would it work on table mats? Celtic plaitwork could be made any size but a table mat size would need to use more pieces and you would need to work out how many chain you needed to start. In my original post I show how to draw out different sizes. For the coasters I used 3 stitches for each crossing point and 5 in one for each corner. They are lovely, so intricate, I made some when I was experimenting for some napkin rings but they were too big. Your lovely examples are a reminder of how much I liked them. I think your pattern is better too so thanks for sharing. Napkin rings sound like a nice idea. I suppose it’s a question of matching pattern and yarn. I can’t get over how vibrant that blue is. It’s gorgeous. Great craftsmanship too. Thank you! The yarn is very good if you like bright colours like I do. It is so kind of you to share your patterns & skills free. My husband is self-employed which is like a gamble in Las Vegas. It’s either feast or famine…. mostly famine. We don’t have Internet so I have to save things to my phone, email them to myself then go down to our apartment’s clubhouse to print them out which is in only black & white. So then I use colored pens to mark each piece in your illustrations. That’s almost as involved as making one. I’m getting ready to start my first one. Can’t wait to see how it comes out. Thank you again for sharing your talent. Would you please advise how I should join the ends? It seems that both the top & the bottom of the row I just stitched need to be joined. Is that correct? Thank you. A reply to both your comments. Glad you like the pattern. Yes you have to join the top and bottom. I use the beginning tail to join the bottom and the end tail to join the top. If you pull the yarn through the last stitch you can make the edges look perfect but since it is at the back it doesn’t really matter. Just join neatly so you can’t see the join outside the overlap. Pattern (UK terms) is at the bottom of the post. It is my own pattern that I created. Oh I am definitely making some of these! I love celtic knots and patterns, oh and the colour combinations are endless. I just want to go home and get started right now! Glad you like them. They are a bit fiddly but otherwise very easy to make! Thank you for pointing out my mistake. I also notice that I should have written treble into the fourth chain from the hook not third! I make the number of chains that I should have put to start the rectangular shape as 42. I would be grateful if you could confirm that that will work. yes I’ll try that and let you know. thanks! Do you have the Multiples for this pattern. I want to make it larger square for a throw. Thanks. Making a larger one would be harder than you imagine to work out I suspect. This post https://rainbowjunkiecorner.wordpress.com/2015/04/27/i-have-a-new-obsession/ shows how I drew out the plaitwork to aid planning. If you made a larger one there would be many many strips and choosing how to use the colours might be difficult too. The coasters look good because all the colours are different. However with some squared paper or a computer drawing program you could draw it all before you started. In the instructions of drawing a plan I suggest four stitches per crossing but I used only three for the coasters so there were no gaps. I’ve had a couple of people asking about making a placemat and one even thinking of a blanket. The trouble is I don’t think this would be very easy. You could make the strips wider if you worked out how to do the turns for multiple rows and the number of trebles needed for the crossovers but it would still be a lot of chains to start. My Celtic bookmarks https://rainbowjunkiecorner.wordpress.com/2017/03/27/celtic-bookmarks/ took three to four hundred chain for the strip. There is also the matter of how many colours you use and how they work together. Using four different colours for a small coaster was easy! So maybe not impossible but a lot of work to devise I think. l have been looking for this pattern ever since l spotted it on a site l came to via Blogloving..l tried and tried to find the link, but l just tripped over it via something else..thanks..l really would like to try this on a bigger scale,, but will start small.. I must admit I am not happy about all these people who put up photos from my site without a by your leave! Google would have found it for you. Very beautiful and impressive though not the sort of crochet I would do. This is super nice!!! I love doing this but I’m having some issues, like maybe my left had simply refuses to cooperate with me. Is is possible that you could do a youtube tutorial on this. I’m a very visual learner. Also, would this be possible to do as a blanket?? I am afraid that I do not do youtube type tutorials and I can’t see that it would make a very suitable or easy to do blanket. Hi I adore this pattern and I could swear it was here in the post just the other day. Now the pattern is gone and I am sad. Yes, but if you look you will see that it is now available for sale on Ravelry. The link at the top of the post will take you to the right page. Is it confusing because it is in the heading font? Maybe I should change that. Sorry, maybe you should have copied all out first time. 🙂 Someone asked it I could provide a copy suitable for printing this is the way I have done it. Aiming to keep cost low. The pattern has to be bought through Ravelry. There is a link at the top of the post or now you can click on the picture of the coaster at the top of the right column. You don’t need to have joined Ravelry to buy it. Purchased the pattern from Ravelry. 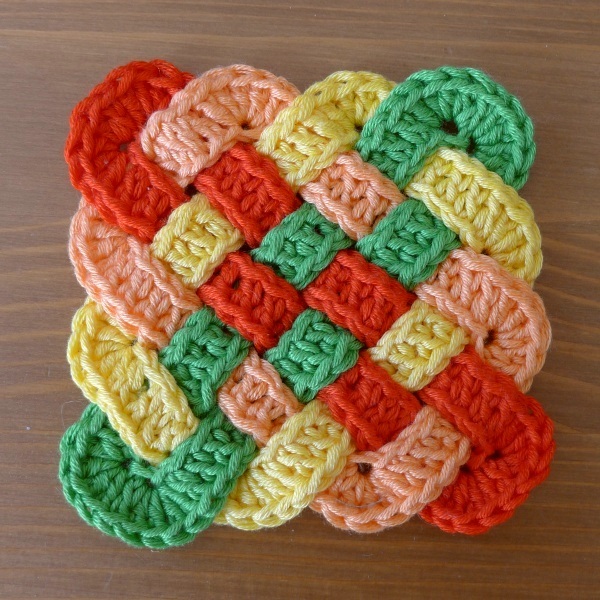 I’m in the U.S. Should I be doing treble or double crochets? Also, having trouble finding a 4mm hook. I’m using a number 3 (light worsted weight mercerized cotton. Is that the correct yarn or thread? I’ve had trouble finding the correct yarn. 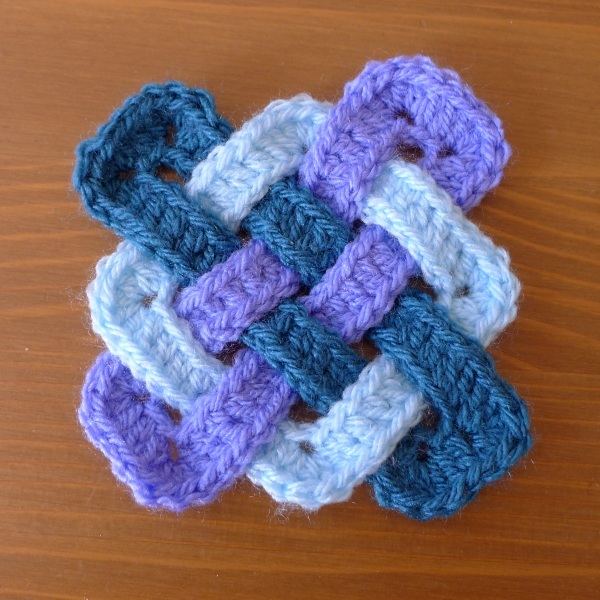 Double crochet in US terms. You should have seen that there were three choices for download. as shown by the file names. The first is UK terms the second US terms and the last is an extra for making a coaster into a blanket square. I use a 4mm hook because I crochet quite tightly and that makes the square how I like it best. Though I have used a 3.5mm and made perfectly satisfactory coasters they are just a bit smaller. The hook size is not critical and it depends how tightly you crochet. Also for the yarn you could use anything. However what you describe sounds like what I recommend. (For myself I have used really bulky cotton and made a small heat pad!) The light worsted is so the coaster is not too big and mercerised because I like the slight shine.